FAQ's:What classes are available?...What's Hatha Yoga?...What are the benefits of yoga?...What is Yin Yoga? 1.Beginners Hatha yoga - a gentle pace with plenty of instruction for beginners or those that have taken a break from yoga. 2.Restorative Yoga -a gentle practice to relax and renew. 3.Yoga for special needs populations - modifications for those with developmental disabilities. 4.Yin Yoga - a meditative practice focusing on lengthening connective tissue for greater flexibility - a great complement to athletic activity such as walking, running or tennis! 5.Chair Yoga - a gentle stretching and strengthening for those requiring a seated or supported standing practice. 6.Hatha yoga-Beginners and Beyond - modifications given for the beginners. More advance students are encouraged to take take their practice to the next level. 7. YOGA PARTY-gather your family, friends or co-workers for a yoga practice customized for your guests. 8. 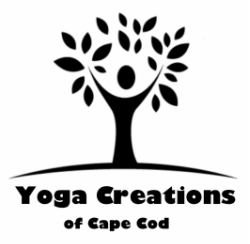 Family Yoga - a 4-class series beginning in January, 2015 at the Cotuit Library. Also available by appointment. Hatha yoga is a mindful practice which focuses on physical strengthening, flexibility and detoxification of the body. Hatha yoga also focuses the mind and allows you to be more in charge of your thought process. Present moment awareness and compassion are practiced throughout class. Breathing and meditation practices are introduced. -greater clarity, focus and happiness. chronic fatigue· depression, diabetes· headaches· heart disease. Yoga is beneficial paired with your existing exercise or sports program. It does not require expensive equipment and is appropriate for all ages given modifications for your age/health profile. For more information on a variety of yoga topics, check out Linda's blog. Yin yoga, a meditative stretching practice, targets connective tissue, specifically ligaments and tendons in the joints and spine. Over time, practice of yin yoga can lengthen these tissues, increasing range of motion. To give an idea of the role that connective tissue plays in determining range of motion: muscles account for about forty percent of the resistance against the body's flexibility, while connective tissue accounts for about fifty percent. The intensity and physical benefits of the practice depend on two variables: duration of the asana (yoga pose), and the temperature of the muscle. time. In yin yoga, asanas are usually held for three to five minutes. Because of the duration of asanas, one of the key values cultivated in the practice of yin yoga is patience. Asanas are almost entirely passive and do not usually include what would usually be classified as standing asanas or balance poses. During the asana, muscles are relaxed to avoid tetany (muscle spasming) which will result from engaging muscles for long periods of time. Yin yoga promotes flexibility and ease in the body and complements fitness or sports activities.